The sales tax hike madness continues as the county commissioners scheduled another sales tax hike public hearing for tomorrow evening at 6pm down at County Center. County revenues are rapidly growing and the county can fund our roads and transportation NEEDS within our growing existing budget. No sales tax is needed but fiscal discipline is required. Unfortunately some of our county commissioners and our county administrator have an addiction. They are addicted to YOUR money and they want more of it. They want more of your hard earned money to grow government, grow the bureaucracy at County Center, fund cronies, fund special interests, fund more crony consultants, fund more pork projects and empower the unelected bureaucrats more who would manage the new boatload of tax dollars. The tax and spend collaborators who are addicted to a sales tax hike think it is "their" money not yours to spend and they want the ability to spend it on anything - like a new baseball stadium. They got addicted with the CIT tax and now they are hooked. The addiction for a sales tax hike reveals many problems. It has turned our transportation issue into an incoherent mess and a Rubik's cube puzzle. One of the biggest problems the addiction for a sales tax hike created was handing County Administrator Mike Merrill responsibility for the transportation issue. Merrill is no transportation expert, he is no professional facilitator, he is not a neutral party on the transportation issue and he is heavily afflicted with the sales tax hike addiction. Merrill, an unelected bureaucrat accountable to no voter, has been waging a war against the taxpayer throughout the entire transportation initiative. When one has sales tax hike addiction, one does not care about priorities. When addicted, the solution to funding our roads and transportation is always raise the sales tax, not prioritize our existing budget to spend prudently and wisely on our highest priorities first. Transportation is only the #1 issue of the tax and spend collaborators addicted to higher taxes when it is all about a sales tax hike. Otherwise, transportation is and has been no priority to those addicted. When the county budgets more money on animal services than funding our neglected and deteriorating roads, transportation is no priority. Sales tax hike addiction resulted in the county handing cronies the $1.35 million Go Hillsborough campaign to sell their sales tax hike addiction to the public. That failed. Handing cronies the phony campaign ensured they would follow the direction of the addicted and propose the only fix the addicted required - a sales tax hike. When addicted to a sales tax hike, process does not matter. To the afflicted, the end justifies the means. That is why Go Hillsborough was so flawed and the addiction so great that it resulted in a law enforcement investigation. Citizens should read the law enforcement investigation because our local media, also afflicted with the sales tax hike addiction, has done a disservice by refusing to report on the actual content. A dark cloud continues to hang over anything associated with the tainted Go Hillsborough. The tax and spend collaborators addicted to the sales tax hike don't care. Common sense dictated the county commissioners terminate Go Hillsborough the moment law enforcement got involved. Those addicted to a sales tax hike have lost any sense of common sense. They are just eyeing the fix of a new boatload of tax dollars to feed their addiction. More proof those addicted to the sales tax hike have no common sense and/or are tone-deaf to today's electorate. At today's BOCC Budget Workshop Merrill is proposing a Citizens Budget Review Committee. 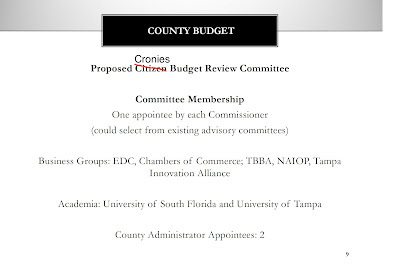 What he is actually proposing is the Cronies Budget Review Committee. Why are only organizations who support the sales tax hike on a Budget Review Committee? 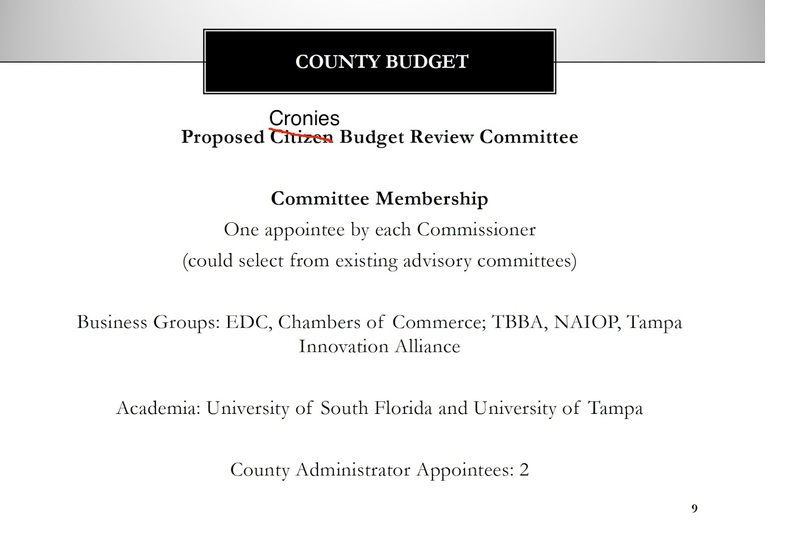 Why are so many entities who already get taxpayer money on a Budget Review Committee? The biggest question is since when does the County Administrator make appointments? Since Merrill became our first unelected policy making County Mayor? This proposal is outrageous. But more proof that Merrill and those addicted to a sales tax hike want to ensure the taxpayer feeding trough keeps flowing. The county commissioners need to outright reject this proposal. The county's current budget states there will be a $300 million surplus by FY2020. Merrill has estimated property tax revenue will grow almost 8% for FY2017. Our county is growing both with new construction hitting the tax rolls and our property values rising again. The 10 year outlook is Hillsborough will continue to grow. As the Eye has consistently stated, the growth of our budget can fund our road and transportation needs. It will take enough county commissioners to push back and stand up to Mike Merrill and his tax and spend collaborators who are addicted to a sales tax hike. Time to force those addicted to a sales tax hike into rehab. Time for the county to fund our highest priorities first within our existing growing budget. Time to stop the sales tax hike nonsense once and for all. Show up tomorrow at 6pm County Center and tell the commissioners No to any sales tax hike. Well said! Any commissioner who votes to put a tax on the ballot needs to lose his/her seat. The County Administrator needs to be replaced.